In 2009 when the Gorran movement gained 25 seats, a fresh chapter in Kurdish politics began with the promise of an era driven by the aspirations of young people seeking to build a new type of party unprecedented in the south of Kurdistan. The man behind this movement was Nawshirwan Mustafa, the former deputy of the PUK leader Jalal Talabani from 1976 until 2007. Gorran was born as the party of change that would fight against systemic corruption and the rule of tribes, especially by the Barzani and Talabani clans. However, after several years as opponents, Gorran and the PUK have this month formed an alliance “for the sake of stability” in the south of Kurdistan. The background is the grave crisis that confronted the Gorran leadership when the Kurdistan parliament leader was prevented from entering Erbil by KDP militia forces and Gorran ministers were expelled from the cabinet last October. Stepping away from its already shaky Strategic Agreement with the KDP, the PUK joined Gorran in protesting at these attacks and political paralysis ensued. KDP sources have confirmed to me that things could have got even worse if secret plans for an overt military coup had been put into effect. These developments proved first that the whole infrastructure and superstructure of the KRG is controlled by the KDP and second that the KDP was willing to deliberately dismantle the institutions of democracy in the south of Kurdistan. Gorran had reached a political impasse and it seemed the PUK could do nothing about the situation. In November the Gorran leader went to London for emergency medical treatment and he was absent from Kurdistan for much of the next period. Although the KDP offered to negotiate with Gorran, the Gorran leadership inside Kurdistan was adamant that, “We cannot negotiate with the KDP unless our ministers and the leader of the parliament can go back to their jobs”. But the scenario in London was different. Almost seven years after the founding of Gorran, its leader had lost any hope of real change. PUK leaders were queuing to meet Nawshirwan Mustafa in London and they managed to finalise a deal this month. 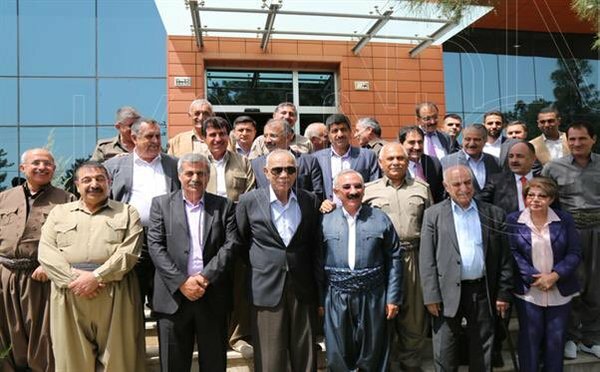 The Gorran leadership have decided to make a pact with the PUK to build a united front against the KDP. But what will Gorran gain from this? It was founded to defeat corruption but the PUK has been jointly complicit with the KDP in all the corruption and abuse that has blighted the region for a quarter-century. As the second largest party in the parliament, Gorran should have taken up negotiations with the KDP, the largest party, focussing less on its positions in the cabinet and more on the everyday concerns of ordinary people, like the unpaid salaries, and it should have reported to its supporters on the progress or otherwise of these talks. Gorran’s politics have signally failed to change the circumstances in the south of Kurdistan. Bit by bit the Gorran organisation now looks more crumbling that uniting. Nawshirwan’s secretary (and close aide for the last three years) and a member of the National Executive Council have jumped ship to join the KDP. Others on the national executive council seem unready or unable to pose an alternative to the idea of unity with the PUK . The agreement between the PUK and Gorran has little real substance and serves to kill off the spirit of change which Gorran initiated back in 2009. The agreement has magnified internal divisions within Gorran and there is also discord within the PUK where perhaps 40% of the membership are opposed to the deal, fearing it will mean a reversion to 50-50 government and the zonal rule of the civil war period. These recent events show that the Gorran leaders have no programme or vision, just animosity for their rivals. I for one was doubtful about the suitability of these leaders for the initial project of Gorran. I hope they will wake up one morning and realise that they are leading the movement into a brick wall and step aside. For Nawshirwan Mustafa it is not just his future but his legacy that is at stake. These past several months provided a critical test of his leadership and will define him forever. This deal has not strengthened Nawshirwan in the public eye because previously he called for corruption to be rooted out and the perception is that he has failed in his strategy and failed Gorran as well. The deal will not strengthen Gorran’s hand in the 2017 elections because it will be harder to rally support when the party doesn’t offer anything significantly different from the PUK. It may be too late for Gorran to move away from Chinese-style leadership but that is now the only way to prevent the gradual destruction of the movement and enable its future progress.